Kenton's Infotainment Scan: Would the last American newsweekly please bring the flag? Would the last American newsweekly please bring the flag? According to yesterday's New York Times, we may be seeing the end of the U.S. newsweekly magazine category, effective almost immediately. Newsweek appears to be headed the way of The Economist by peddling "views over news" and aiming for an "elite" target audience - translation: big income earners - which advertisers still want to reach. 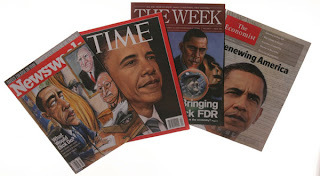 That would leave Time Magazine as the sole newsweekly in the U.S., which is especially bittersweet here in Canada, considering that Time recently announced the end of its Canadian edition. I'm not surprised that Time did it: I'm sure that most readers didn't even realize there even was a Canadian edition, except for the occasional surprise, like the April 2005 cover story on Arcade Fire. We've been talking about the death of print a lot in our advertising and PR classes lately, and it does seem that a revolution is upon us. In the past few months alone, we've heard about the Winnipeg Free Press, the Winnipeg Sun, and CanWest Global (a Winnipeg-based media conglomerate consisting of mostly newspapers and TV) laying off their staff, while the Sun reportedly is heading toward becoming an online-only entity. The question is: when print finally does kick the bucket, what kind of journalism will we be left with, and how will it be supported? Will we see an online news business model that has credibility and makes money, or will we see something more akin to the music industry, where mostly unpaid and untrained journalists report the news, and we consume it - for free? I'm sure that most of us will continue to be riveted - to the Internet - to find out how this all turns out. In the meantime, maybe the traditional news media can learn from Graham on the "Progressive Winnipeg" blog, who recently pointed out (spelling his): "Maybe time for the Sun and the FreeP to get a head start and get on designing better web pages."